Soooo, it turns out that Austin apparently has freezing winter days too. Ok ok, I may have noticed a slight dip in the month-long forecast for our stay here when we were driving away from winter in Kansas city. But hey, if a “dip” here means just pulling on a pea coat (vs. my usual puffy-furry-down-lined-marshmallowness at home), walking around town in a crisp breeze (vs. trudging through snow and negative windchills) for just a few days (vs. what I’m pretty sure feels like decades at a time at home)…I’LL TAKE IT. Ok ok, I’ll stop rubbing it in. I’m well aware that I’m heading back to the land of freeze-your-toes-off arctic blasts in three days, so I’ll be back to seriously needing a soup like this soon. But in the meantime, it also warmed us up nicely down here in Texas. 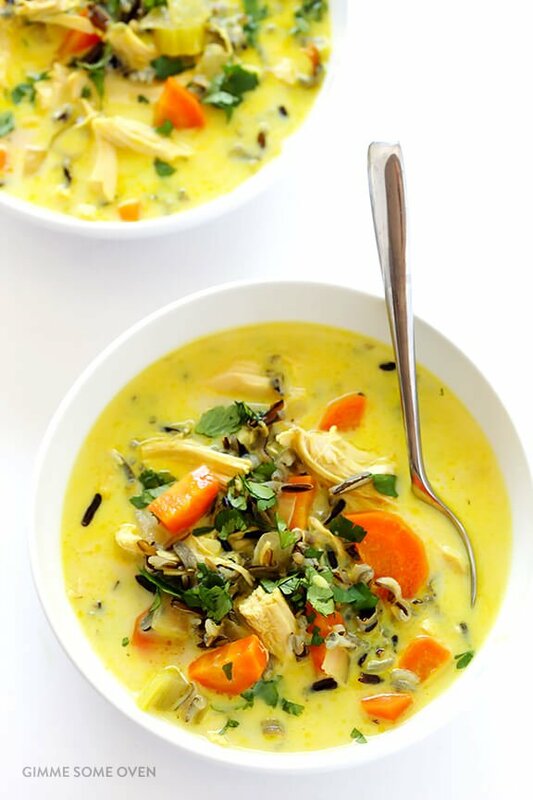 And I must say, at this point in the winter when I’ve already made my way through all of my traditional soups, it was kind of nice to switch things up a bit with a curried take on a classic — chicken and wild rice soup. I have mentioned on here before that I’m (surprisingly) fairly new to the curried world. For basically my entire twenties, some mystery ingredient in the magic potion that is curry used to upset my stomach big time. I tried for years without success to pinpoint the culprit spice, and was about to just give up and decide that curry was going to hate me for the rest of my life. BUT. Lately I have been very slowly reintroducing curry back into my life. And surprisingly, it has been perfectly fine. Like, perfectly fine. What the heck?! Anyway, that said, I have been doing some mega catching up over the past two years on every epic curry opportunity I have missed over the past decade. And without a doubt, much of that is happening in the soup world. I love a good curried soup. Especially simple ones like this one. 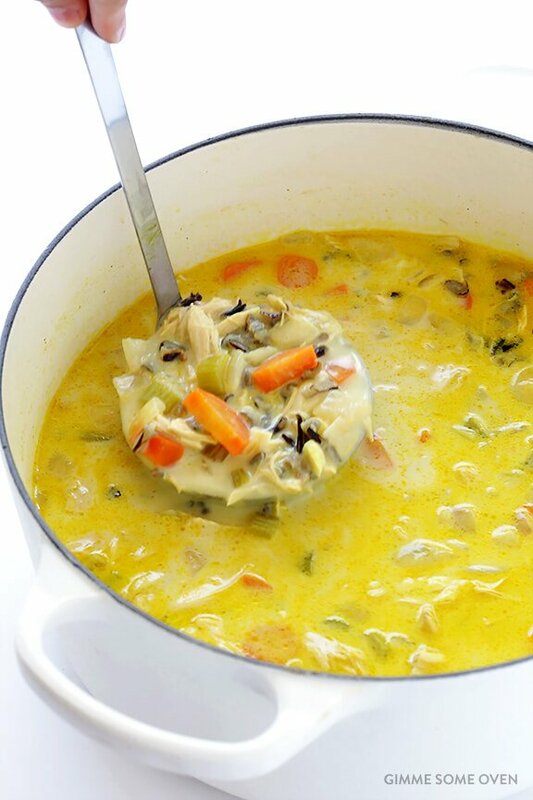 It’s all of the goodness of traditional chicken and wild rice soup. But instead of cream, I went with coconut milk. And instead of Italian seasonings, it’s curry for the win. It’s easy to make, nice and creamy, perfectly (and fairly lightly) spiced, naturally gluten-free, and mmm mmm good. Perfect for warming you up on a chilly day, whether that’s in south Texas or northern Canada. It’ll do. 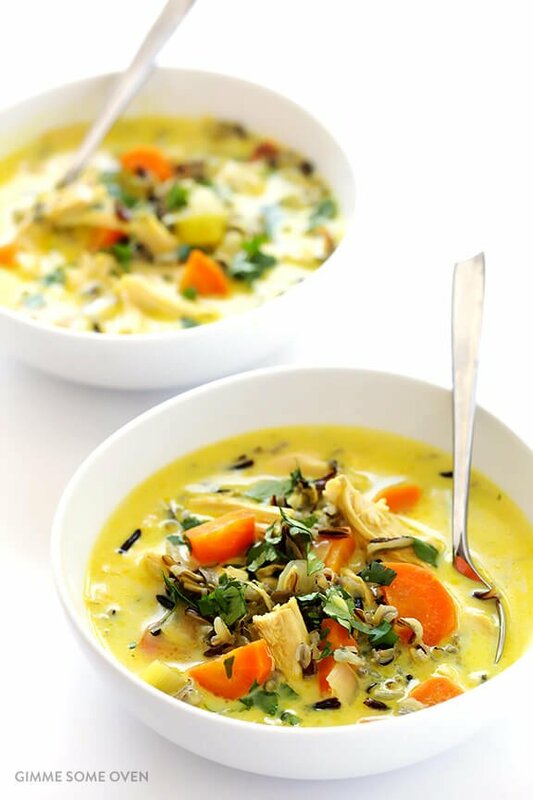 This Curried Chicken and Wild Rice Soup recipe is easy to make, nice and creamy, perfectly (and fairly lightly) spiced, naturally gluten-free, and mmm mmm good. 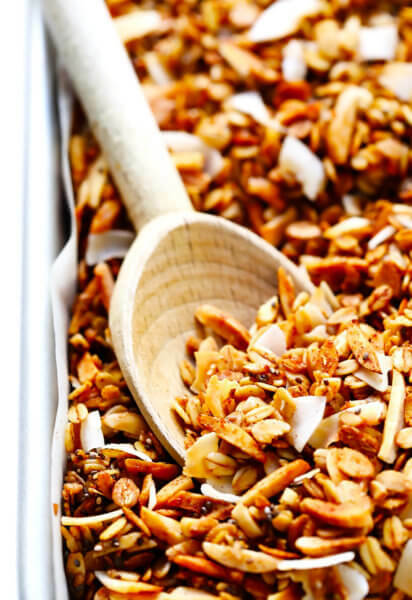 Begin by cooking your wild rice. Stir together the wild rice and 4 cups of water in a medium saucepan until combined. Cover and heat over medium-high heat until boiling. Then reduce the heat to medium-low, and simmer (covered) for 40-45 minutes until the rice is cooked and tender. Strain out any extra water, and remove from heat. While the rice is cooking, heat the olive oil in a (separate) large stockpot over medium-high heat. Add the onion, carrots and celery and cook for 6-7 minutes, until the onion is soft and translucent, stirring occasionally. Add the garlic, and cook for an additional 1-2 minutes, until the garlic is fragrant, stirring occasionally. Add the chicken stock, chicken, curry powder, bay leaf, cumin, salt and pepper, and stir to combine. Stir in the coconut milk until combined. Continue to cook until the soup reaches a simmer. Then reduce heat to medium-low, cover partially with a lid, and let the mixture simmer until the rice is ready. Once the rice is cooked, stir it into the soup until combined. Remove the bay leaf. Then taste the soup, and season with extra salt and pepper if needed. 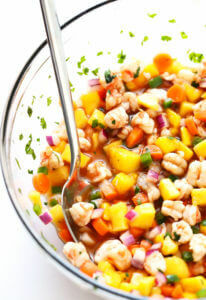 Serve warm, topped with optional garnishes if desired. *I tried a few different curry powders when testing this soup, and I actually loved classic ol’ McCormick curry powder best. But go with whatever brand you love. 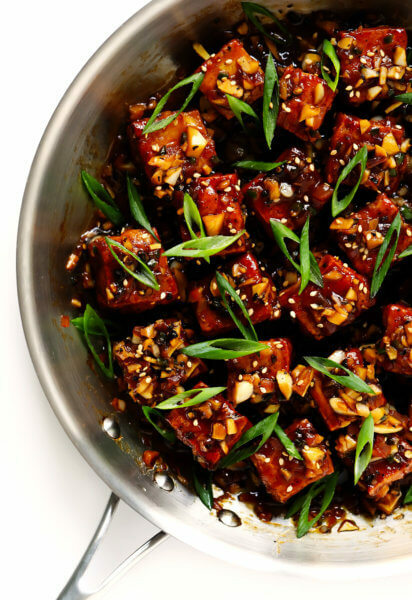 **I used a can of full-fat coconut milk in this recipe. But you can substitute in light coconut milk instead. Or if you would rather pass on coconut milk, you can substitute in a can of evaporated milk. I love anything with curry in it! And I’m so cold right now brrrr Boston winter!! Will have to try this! Yum, yum and YUM! This soup looks awesome. So glad you can reintroduce curry into your life because curry is just too good. And now we get to all benefit with your awesome curry recipes!! 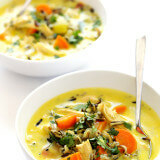 I’m not the biggest fan of curry, but looking at this soup, I may have to give it a try. I hope you enjoyed your stay here in the great state if Texas and hopefully you won’t have to deal with winter weather too much longer when you return to Kansas. I live in Dallas and for the past few days it’s been cold, icy and wet. I’m looking forward to Spring again. Man… I wish this had popped in my inbox sooner. I am ALL about curry, and this looks so soooo good. Would be perfect for lunch only it’s already 12:19 and this ain’t happening today, but I sure wish it was!! I’m thinking this’ll be the perfect thing to come home to after church on Sunday. Mmmmm. I can see it now. Yes. This is happening. Thanks for the great recipe coupled with some honest-to-awesome writing. You are a must-read in my inbox. This looks so yum! I have been loving soup lately even though our weather is pretty dang warm for feb! This ones gettig pinned and put on the list. Thanks! So happy you can eat curry! You do have some catching up to do! There are so many different types of curry, too. I pretty-much love them all! Pinning this recipe. I want some right now! Ooh! 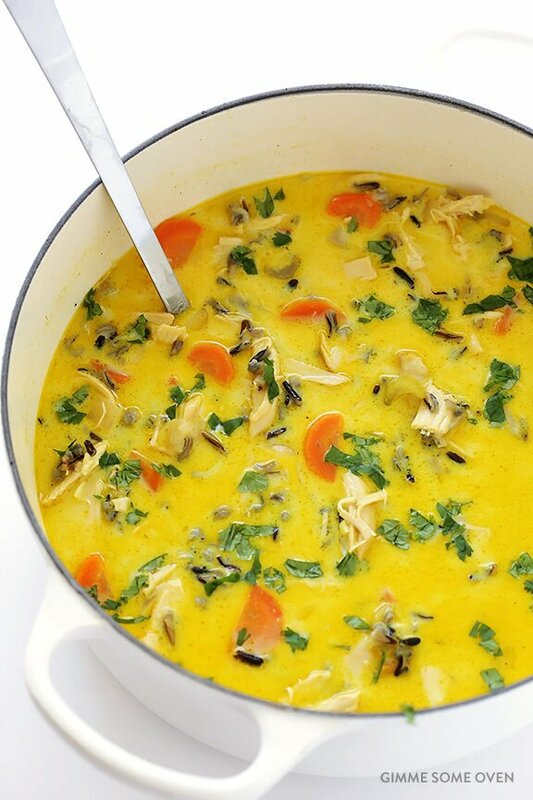 I had a creamy wild rice & chicken soup on my menu plan for Monday. But maybe I’ll skip that heaviness and go with this lighter take – the warmth of curry sounds juuuuuust perfect for the freezing cold and slick snow we’re enduring! This is amazing! The smell is so tantalizing to the taste buds! The flavor is so warming and delicious! I will be making this again and again! This is fantastic! What a great recipe — thanks so much, Ali! This was delicious! I burned the wild rice I was using (oops) so used brown rice and it was still wonderful. So deliciously rich but not heavy. My husband thought it tasted even better the next day! Definitely adding it to the rotation. Girl! Welcome back to the world of curry!!!! I just tried this out, and wow, is it good! Other than omitting the additional salt and pepper at the end, I made no changes. It doesn’t seem to make much, though, so next time I’ll double it for extra leftovers. I’m seriously loving this recipe so much that it makes my normal chicken soup recipes seem bland. Thanks for the great recipe! For anyone who is interested – I vegetarianized this by using Better Than Bouillon No Chicken stock and subbing 2 drained and rinsed cans of chickpeas for the shredded chicken. It worked perfectly and I can’t wait to take this to work for lunch all week! Great recipe! Thanks Gaby! Love your additions too — yum! This looks sooo delicious, I love soup. Not my husband so much and I love that you have a gluten free recipe area. Hi Talyn! You can most definitely try this without the chicken, and with a veggie stock. It will taste different, so you may need to adjust the seasonings, but otherwise, you should be fine. We hope you enjoy! Eating this right now…uh…YUUMMMM!!!! The husband and I are obsessed!!! This looks really good! But can I use jasmine rice instead of wild rice? Ali, I’m trying to work more chicken dishes into my diet and wanted to give this one a go. I tend to trend toward crock pot recipes and was curious if you think this would be OK from a crockpot perspective. I’d probably put the chicken in raw as I normally make shredded chicken this way and just add the coconut milk when I get home in later. I also will probably use four cups water w/chicken bouillon instead of chx broth. I’ve never slow cooked rice before, however. any tips for slow-cookering this recipe up? I think that this recipe would actually do well in the slow cooker, if you wait to add the coconut milk until the end. And if you use chicken bouillon, just be on the lookout in the ingredient list for MSG — they like to sneak it in there, eek. Enjoy! I made this last night and all I can say is, “WOW!” My entire house smelled amazing, and it tasted even better than it smelled! Thank you so much for the wonderful recipe. The only change I made was adding mushrooms and green beens, delicious! Thank you Chelsea, that’s such a nice compliment! We’re happy you liked this so much, and we think the mushrooms and green beans additions sound wonderful! 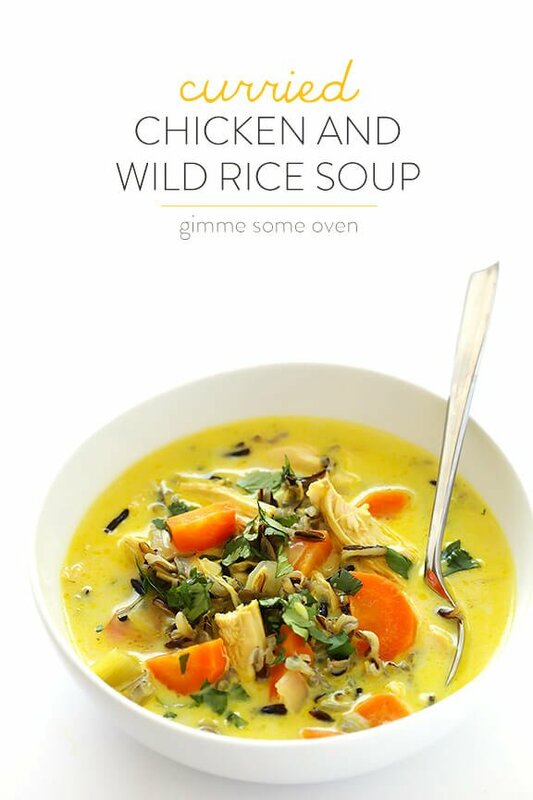 I was craving chicken and wild rice soup, and I love curry, so win-win! I made the recipe as is, but substituted evaporated milk due to an allergy to coconuts. This was very good, but I would add more veggies and chicken as mine was pretty liquidity. I cheated with a Rotisserie chicken, and 3 cups was pretty much the entire chicken. Also my thinking it needs more “stuff” could be because i didn’t exactly measure my carrots and could have thrown in one more. Thanks for sharing! We’re glad you liked this Laura, although we’re not sure why it came out liquid unless it was the evaporated milk. And cheating with rotisserie chicken is totally fine! :) Thanks for giving the recipe a try. Since I found this recipe a few months ago, I’ve made it a few times. My husband and I absolutely love it. The curry I use is the Kroger store brand and it reminds me of Japanese curry that I love making, only better! The only differences that I do when making it is adding mushrooms and using Jasmine rice instead of wild rice. This is hands down one of my favorite recipes! Made this last night since winter has finally decided to arrive in Toronto and there was a storm last night. So good! This is definitely going in my rotation. I used jasmine rice since that’s what I had and I think in the future I’ll double up the rice and add more veggies but what a great base recipe. I am making this tomorrow for dinner and honestly couldn’t be more excited! I have two quick questions though, and if they seem silly I apologize. Firstly, do I cook my rice according to its directions or should I follow your 45 minutes? Secondly, is just white shredded chicken ok or do you suggest both white and dark meat? Thanks SO much and I can’t wait for this meal! So another great recipe from you! My husband also liked it which is awesome. I just made it in the crockpot instead. Added the rice about 6.5 hrs in, put the rice in and let it cool til the rice was done. So amazingly delicious and I will totally eat this again. I know it’s a little early in our relationship for this, but I love you. Haha! This soup is epically good!!!!! I’ve made it a few times. It definitely depends what type of curry you use and also coconut milk. This soup looks delicious! I can’t wait to try it. Just wondering if it freezes well? This soup is so good! My husband is not a fan of traditional chicken soups, but we both thought this was great. We tend to like things spicy, so I used spicy curry powder and added a full tablespoon, which ended up being just right for us. Thank you for the unique recipe! I am making this soup with my leftover turkey and the broth I made from the carcass. I need to run out for wild rice, but already the house is filled with a delectable aroma and the taste I took while it’s simmering is luscious. This will be my go-to recipe from now on. Yum! Made this a few years ago and liked it, but evidently didn’t get around to making it again until recently, and wow am I kicking myself … this is SUCH a good soup. The husband keeps raving about it too, and as good as it was on day one right out of the pot, I think it gets even better with a bit of time in the fridge. This is going to stay in the rotation for a long time!